Tobacco is an extraordinary problem requiring extraordinary action. The WHO European Region has made significant progress in tobacco control in recent decades, including through the adoption of the WHO Framework Convention on Tobacco Control (WHO FCTC) and the development of a roadmap of actions that was signed by health ministers of the Region in 2015. Despite these commitments and this progress, tobacco control remains difficult and complex. The tobacco industry and its allies have consistently opposed effective tobacco control measures, and their strategies and efforts to subvert the policy process have become even more determined, focused, misleading, aggressive and sophisticated. Policy-makers need to be equipped with clear facts and well founded arguments to counter the myths generated by the tobacco industry. However, no single source has yet provided the resources necessary to understand how tobacco industry players act, and how governments and the public health community can respond to their arguments. In light of this, WHO/Europe developed the Tobacco Control Playbook. The Playbook is an accessible online tool that counters many of the myths about tobacco that are often presented as truths by the tobacco industry. It aims to equip policy-makers and the general public alike with the facts about tobacco consumption. In the face of ruthless and cynical opposition from the tobacco industry, however, it is necessary to do more than simply cite evidence-based research. For this reason, the Playbook also offers a well developed narrative that challenges the most common myths about tobacco control. The Playbook’s content reflects the challenges that tobacco control leaders have faced while implementing various articles of the WHO FCTC, and highlights arguments they have developed in order to counter the tobacco industry and succeed. The Playbook is intended to be a living resource, regularly updated and extended with further arguments and on the basis of feedback. It will also be adjusted and expanded to take into account any new developments in tobacco industry approaches. 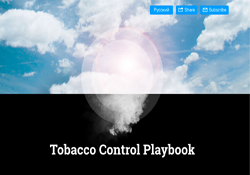 Everyone concerned with tobacco control is invited to contribute to the Playbook’s success by continuing to offer arguments and responses, and by sharing their experiences of using the Playbook. Please send input to eurotobaccofree@who.int. Health ministries and tobacco control advocates are committed to the shared goal of a Region free from tobacco-related morbidity and mortality. The hope is that the Playbook will prove to be a valuable resource for sharing experiences and best practices for countering the tactics of the tobacco industry, and that this will, in turn, strengthen tobacco control efforts across the Region. The Playbook was financed by the Ministry of Health of the Russian Federation in the context of the Project on the prevention and control of noncommunicable diseases.